UPDATE: Please send photos here if you make it out to a Hobby Lobby tomorrow. 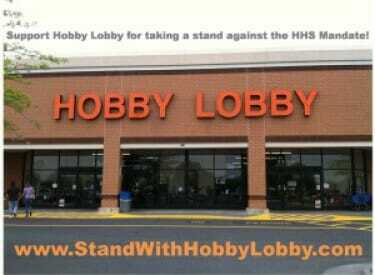 ** Find a Hobby Lobby near you. The Saturday hours are 9:00 AM to 8:00 PM. On Saturday, January 5th, all Americans who value freedom of religion and oppose the HHS Mandate’s unfair impositions upon religious individuals and corporate entities are called upon to show their support for Hobby Lobby by shopping either at their local retail Hobby Lobby store or online. PLEASE SHARE THIS EVENT WIDELY! • September 12, 2012: Hobby Lobby files suit against Kathleen Sabelius and the US Department of Health and Human Services in US District Court for Western District of Oklahoma. They are represented by the Becket Fund for Religious Liberty. • November 19, 2012: District Judge Joe Heaton rules that privately owned companies such as Hobby Lobby are not exempt from the HHS Mandate on religious grounds because these enterprises do not possess the same religious rights as individuals and religious organizations do. • December 20, 2012: The US Court of Appeals in Denver rules against Hobby Lobby on the same grounds as the lower court; the Green family vows to appeal to the US Supreme Court. • December 26, 2012: Justice Sonia Sotomayor rejects an emergency request for injunction that would allow Hobby Lobby temporary exemption from the HHS Mandate pending the hearing of their full case before the high court. • December 27, 2012: Hobby Lobby’s attorneys announce that the chain plans to defy the Mandate which will take effect January 1st, potentially costing the chain (which employs 13,000) hundreds of millions of dollars in fines by the time their case is finally decided. Please support this great company and this great cause. Maybe I’ll see you tomorrow!